Gather together with no distractions to light the first candle and share this time of spiritual fellowship. First Reader: We light one purple candle as a symbol of hope. Advent means “arrival.” We wait to celebrate Christmas when Jesus first arrived as a baby. We are also waiting for the day when Jesus will return again as the Lord of all. Second Reader: Let’s listen closely to God’s word for us in our Bible passage. Conversation: Take turns talking about those verses. What stood out for you in the Bible passage? Why did it draw your attention? What does it mean for your life today? One: Dear God, you fill our hearts with hope while we wait for Jesus to arrive. All: God, you are good! You always keep your promises. One: Send your Spirit to help us remember that you are faithful when we cannot see you. All: Let your steady flame of hope keep glowing in our hearts and lives. One: You are bringing us closer to the day when everyone will know Jesus as Savior. All: We worship and praise you, Lord. Let the day of your arrival come soon! Gather together with no distractions to light the candles on the Advent wreath and to share this time of spiritual fellowship. First Reader: Today, we light two purple candles for hope and love. God loves the world so much that God sent messengers—the prophets and John the Baptist—to help us cleanse our hearts and minds to get ready for Jesus. One: Holy God, you sent prophets to help us clear the way for the Messiah. All: Help us to listen closely to your message of warning and to respond with faith. One: You have made each person a precious vessel of your Spirit, but we have become tarnished. All: Thank you for washing away the sin from our hearts so that we will reflect your light. One: You call us to clear away what is unworthy in our lives and to make room to welcome Christ. All: May our whole life become an offering that is pleasing to you, Lord. First Reader: Today is the third Sunday in Advent. 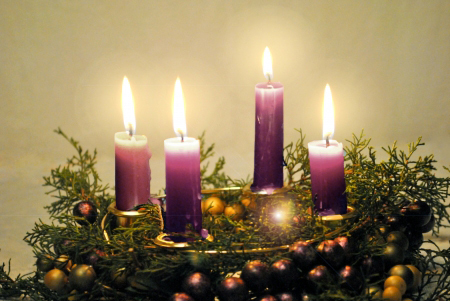 We light three purple candles (or two purple candles and a pink candle). They are symbols of hope, love, and joy. Our deep joy is a reflection of God’s gracious love. Our joy comes from the greatest gift that only God gives: our sins are forgiven. One: Dear God, you are present by your Spirit to defend us against our enemies, sin and fear. All: You take away our mistakes of the past, so we will not be afraid of judgment. One: You renew us in your love, rejoicing over each person you have made into a new creation. All: You give us great joy! Help us share your love with our family, friends, and neighbors. One: Through Jesus Christ, you draw together the whole human family and lead us home. All: We look forward to the day when we will praise you with all the peoples of the earth! Gather together with no distractions to light the candles o the Advent wreath and share this time of spiritual fellowship. First Reader: Today is the fourth Sunday in Advent. We light four candles for hope, love, joy, and peace. God helps us to wait for the arrival of Jesus, our Lord. He brings lasting peace to people everywhere. One: Gracious God, long ago you made the shepherd David of Bethlehem a king of Israel. All: Thank you for raising people from small towns and big cities to follow you in faith. One: You promised that a Son of David will be the peaceful king whose reign lasts forever. All: At the right time, you fulfilled your promise in Jesus, the Prince of Peace. One: Jesus is the good shepherd who peacefully feeds his flock and helps us to live in safety. All: Help us to show by our calm words and peaceful actions that we belong to you. Gather together with no distractions to light the candles of the Advent wreath and to share this time of spiritual fellowship. Family members might enjoy reading aloud the parts: the narrator, the angel of the Lord, and the shepherds. Everyone may join in as the multitude of the heavenly host. First Reader: We celebrate the arrival of Jesus, our Lord! We light the four candles for hope, joy, love, and peace. We also light the white candle in the center to remind us of Christ, the light of the world! One: Dear God, we gratefully celebrate the birth of your only Son, our Savior Jesus Christ. All: You have brought us through this season of waiting. Our hearts are full of your love. One: We join our voices with the angels, who are always singing joyful songs of praise to you. All: Glory, glory, glory to God in the highest heaven! Peace to all of God’s people on earth! One: Make us faithful witnesses like the shepherds who told their neighbors: the Savior of the world is here! All: The glorious light of Christ shines brightly for everyone. Hallelujah!